We did it! We got the Locost on all four wheels. 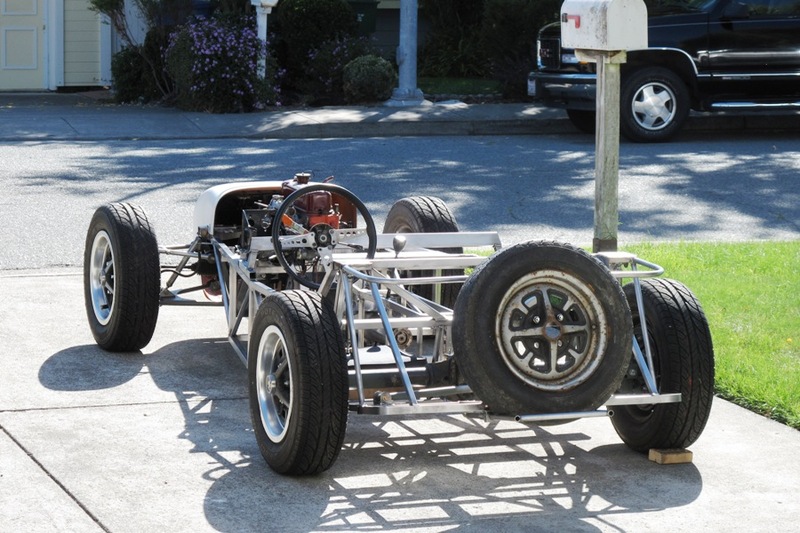 This has been one of the longest phases of the project, taking a basic Locost frame and turning it into something that we can roll up and down the street. Of course we haven't actually done that yet, rolled it up and down the street, but we haven't ruled it out yet, either. According to our highly-detailed yet wildly inaccurate build plan we are almost exactly 50% complete, but that's something we hope to disprove by whipping through the final stages of the build with a can-do attitude and an experienced hand, assuming we can find anything like that around here. 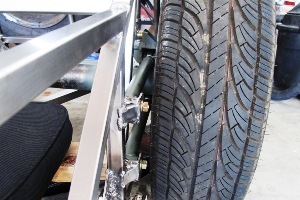 With the chassis together we were able to take measurements of things that we only guessed at before, like the wheelbase. Ours measures 90-3/4", which seems shorter than I remember from our PowerPoint drawings, but it is in fact adjustable, should that be even remotely necessary, by lengthening the rear trailing links. 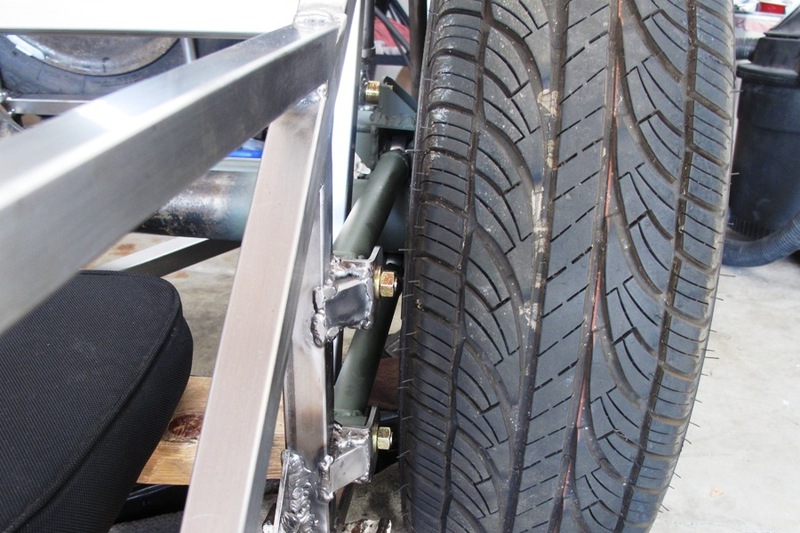 Our front track measures 52-1/4", a half inch wider than our rear track of 51-3/4", which measures exactly that and pretty much had to, since we used a stock 49-1/4" MGB axle and a pair of 1-1/4" wheel spacers. If your eyes tend to glaze over when you see all of those numbers, don't worry, ours do too. Unfortunately we're not done yet. Our driveshaft needs to be shortened. The distance between the rear transmission flange and the front differential flange is 21", give or take 1/16", so we're thinking the driveshaft should be 20-3/4" fully compressed. The U-joints and extension take up about 8" of that, so the actual driveshaft tube will barely be a foot long. This is going to be a job for a machine shop, not because we couldn't do the welding ourselves, because we totally could, but because we don't have the equipment to properly balance it. Who needs a hood anyway? 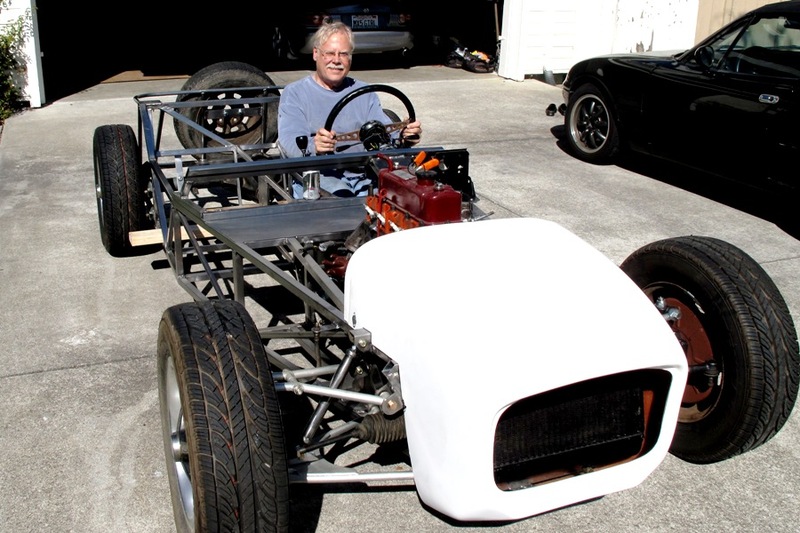 Ground clearance with our fake wooden shocks is six inches front and rear. We think the front end will be lower with actual shocks, since the lower A-arms aren't quite parallel to the ground right now, but it won't drop below 5" in any case. 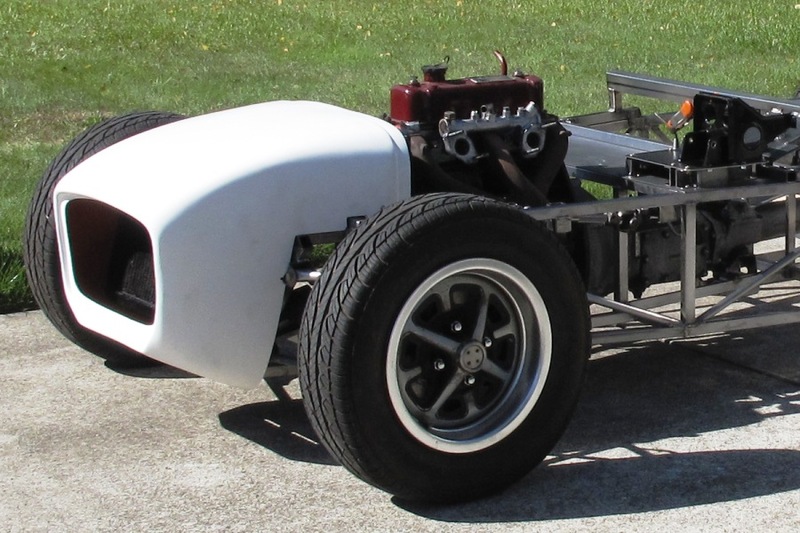 What's more certain is the bonnet bulge, which is going to be every bit of 2" high at the front of the engine, based on where the fiberglass nose cone currently meets the valve cover. Of course the big S.U. carburetors will sit just as high and stick out a lot, but we'll worry about clearance for those later on. Or never. The next highest point on the engine is the thermostat housing, which might need a slight bulge of its own. The upper radiator hose, which attaches to the housing, may just clear the underside of the nose. If we'd mounted the engine even a little bit higher, we'd have a problem, but we're okay where it is now. If the hose rubs against the fiberglass nose, no big deal, since we're mainly only concerned with clearance issues if they make noise. That's so awesome! 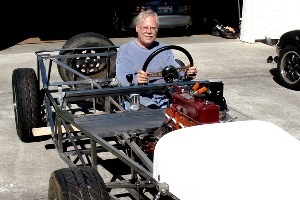 Sitting in a car you entirely made from a pile of steel tubing, and some parts from an old little car. I can only imagine the feeling of accomplishment and pride as this last picture was taken. Not to be forgotten is your great journalism and way of conveying your thoughts to us.